Could this just be the gig of the year? Could this just be the gig of the year? In the history of world music, Afrobeat is writ large. And no-one was or is bigger than the musical legend, social commentator and cultural icon that was Fela Kuti. To honour this exceptional man, some of the greats from Fela's past are getting together with the some of the contemporary artists that cite Fela as a musical hero and are putting on a major concert entitled "Saluting the Black President" on Friday 17th May. Listen to the line-up: Ginger Baker (most famously drummer with Cream and a past Fela collaborator), Tony Allen (previously Fela's drummer and responsible for shaping afrobeat's rhythmic base) and Dele Sosimi (previously Fela's keyboardist). Joining them from the younger generation will be Blak Twang, Afrikan Boy, BREIS, TY and Shingai Shoniwa. The musicians, singers and rappers will offer their interpretations of Fela songs and will collectively contribute to a magical evening, aided and abetted by the musical backdrop provided by the inimitable Dele Sosimi and his Afrobeat Orchestra. This special event is a chance to keep Fela's spirit alive, to honour and salute the Black President - and to get up and dance to the sounds of Afrobeat. T he concert at 229 Great Portland Street, London W1W 5PN is being put together by Knitting Factory Records in association with one of London's leading concert promoters, AGMP. (Details at bottom of this page). Knitting Factory have reached out to a number of artists, some of whom knew Fela well and worked with him, to honour the Nigerian icon and Afrobeat originator Fela Kuti and to celebrate the re-packaging and re-release of his entire catalogue (Vol 2 of "The Best of the Black President" was released in March 2013: www.worldmusic.co.uk/fela_kuti_the_best_of_the_black_president_2_out). Legendary Cream drummer Ginger Baker is known as "Rock's first superstar drummer". But he is also noted for his involvement in African and Jazz music. He lived in Nigeria from 1970 till 1976 and in 1971 recorded a live album with Fela ('Fela with Ginger Baker Live! '), which was recently included in a list of 40 Best Live Albums on The Quietus website. "I met Fela in the early 60s when he used to sit in at the all-nighters at the Flamingo. We became good friends. When I arrived in Nigeria in 1970 I met Fela again - this led to many musical adventures. Fela was a fantastic fellow, a great friend, I loved his music. Tony Allen was Fela's drummer/band leader and we too became good friends. I last played with Tony at the Zildjian Awards in 2008; I'm looking forward to meeting again." Drummer Tony Allen was instrumental in the creation of Afrobeat. He was an original member of Fela's Koola Lobitos highlife-jazz band and later of Fela's Africa 70 band (1968-1979). Brian Eno has described him as "perhaps the greatest drummer who has ever lived." "When I was invited to take part in this event I couldn't resist. Firstly to honour a man with whom I played for so many years and for whom I have nothing but affection and respect. Also just the idea of climbing back onstage with Ginger Baker thrilled me. At the Berlin Jazz Festival in 1978 we joined to play a 15-minute drum solo. This guy can play! And here we are again, 35 years later. I can't wait!" Keyboard player Dele Sosimi was the musical director of Fela's Egypt '80 band (1979–1986), and he later became the founding member, musical director and band leader of the Positive Force (1986 to 1994), the band of Fela's son Femi Kuti. The Afrobeat musician, composer, producer and educator is now UK-based and leads his own band, the Afrobeat Orchestra. "To celebrate Fela is more than an honour - it's my duty. Fela is the reason Afrobeat music is in my DNA, coarsing through the essence of my being and coming out in the various formats that I perform in, to a devout worldwide audience of Afrobeat enthusiasts who will take advantage of every opportunity to savour appreciate and gyrate to this unique genre. The legacy of Fela will live on and pass on from us onto the next generation ad infinitum! Long live Fela! Long live Afrobeat!" One of the pioneers of UK hip-hop, Blak Twang is famed for his worldwide live performances and his ability to seamlessly blend London slang with conscious lyrics. This unique technique makes him a firm favourite with hip-hop fans as the original South London Rebel. "Growing up in my house, my parents played lots of Fela's music. My family and Fela's family are from the same area in Abeokuta and they attended the same church where Fela's father was the Pastor. Fela was like the superhero, the people's Champion that was the voice of the voiceless. When I was asked to be a part of it, I was honoured because his music has truly been a big influence on my musical content and helped shape me as the artist I am today." The Nigerian-born London-based grime MC Afrikan Boy has worked with artists such as M.I.A. and The Very Best and has performed globally, including at Damon Albarn's Afrika Express shows. "This project is the closest I will get to our late Black President. Fela was and still is a huge fountain of inspiration to my music. In many ways you can say he lives through our music through his music. The new generation is learning and taking his messages to the new world. I represent the image and power of Fela through my own performances to remind people of our roots and culture! I no be gentleman at all o! I be Afrikan Boy Original!" BREIS (breeze) is a dynamic, London-based hip-hop lyricist, full of wit and wordplay. His sound is a fusion of the hip-hop, Soul and Afrobeat he listened to growing up in both the UK and Nigeria. He has toured internationally and shared the stage with artists such as Black Thought (of The Roots), Angie Stone, Nneka, Les Nubians, Tony Allen and Kim Burrell and in 2012 was invited to give a TEDxYouth talk and performance. "It's an honour to be part of this event. The way Fela presented his music to the world was totally unique. On stage he would sing, discuss issues, dance, play the music, interact with the people, orchestrate the band and dancers. I've learnt a lot from him. Let's do this!" A consummate live performer, with a career spanning more than a decade, rapper and producer TY was born Ben Chijioke. TY has worked alongside other hip hop greats such as Scratch Perverts, Talib Kweli and Arrested Development, collaborating on tracks with a whole host of artists, including De La Soul. "It's an honour to celebrate the legacy of one of the most important men in music." 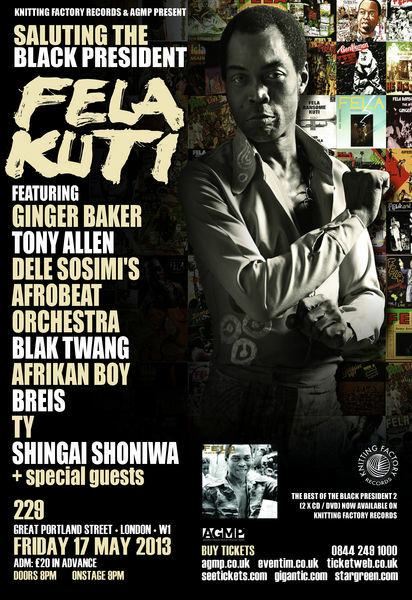 Fela was a Pan-Africanist, which was clear by his lyrics and statements (he was also friends with Burkina Faso's revolutionary leader and famous Pan-Africanist Thomas Sankara), so it's fitting that alongside many talented musicians with Nigerian roots, the event also features none other than Shingai Shoniwa, vocalist and bassist for the UK indie rock band Noisettes. Born to Zimbabwean parents Shingai will also represent the spirit of the strong African woman, like Fela's mother and his Queens. "I am very proud to be honouring Fela in the forthcoming tour de force that will be 'Saluting the Black President'. His classic song 'Lady' is an uplifting masterpiece that celebrates the role and impact of women in African society. Throughout the lyrics Fela effortlessly cites what he loves about the attitude and grace of the 'African Woman' with a timeless wordplay, powerful enough to make you laugh until you cry. Fela's poetic observation inspires me to no end as a musician and performer, proudly infusing my African roots throughout my international work. I'll be looking forward to channeling the spirit of our great uncle of Afrobeat on stage. It won't be long until you realise that you haven't danced until you've danced the 'fire dance'." Nigerian icon and Afrobeat originator Fela Kuti passed away 15 years ago but to this day his legacy lives on across the globe with his still-relevant, forthright political views and powerful music. The complete works of Fela, consisting of almost 50 albums, have now been re-packaged, with in-depth track commentaries written by Afrobeat historian Chris May, for a three-batch re-launch between March and September 2013. The re-release programme has been spearheaded by the new compilation 'The Best Of The Black President 2' (out 4 March 2013), which includes 1975's "Everything Scatter", probably one of the ultimate Afrobeat tracks, as well as an extended version of the classic "Sorrow Tears and Blood". The 2CD collection comes with a foreword written by Senegalese-American R&B/hip-hop artist Akon and track commentaries written by Chris May. A special deluxe edition of 'The Best Of The Black President 2' also includes a DVD of Fela's legendary 1984 Glastonbury concert. The second tranche of releases is planned for 20 May with a further 10 CDs each containing two albums. "Saluting The Black President - FELA KUTI"